1) It`s an incentive to show up. 3) It leads to more honest communications. 4) It reduces complaints about low pay. 5) It cuts down on time off because you can work with a hangover. 6) Employees tell management what they think, not what management wants to hear. 7) It helps save on heating costs in the winter. 9) Increase job satisfaction because if you have a bad job, you don`t care. 10) It eliminates vacations because people would rather come to work. 11) It makes fellow employees look better. 12) It makes the cafeteria food taste better. 13) Bosses are more likely to hand out raises when they are wasted. 14) Salary negotiations are a lot more profitable. 15) Suddenly, burping during a meeting isn`t so embarrassing. 16) Employees work later since there`s no longer a need to relax at the bar. 17) It makes everyone more open with their ideas. 18) Everyone agrees the work better after they`ve had a couple of drinks. 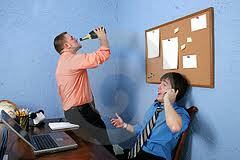 19) Eliminates the need for employees to get drunk on their lunch break. 20) Increases the chance of seeing your boss naked. 21) It promotes foreign relations with the former Soviet Union. 22) The janitor`s closet will finally have a use. 23) Employees no longer need coffee to sober up. 25) Babbling and mumbling incoherently will be common language.